Panasonic has unveiled its new DMC-GX1 Micro Four Thirds system camera, but admits it still faces a challenge in weaning the mass market off traditional compacts. ?We want to be number one in interchangeable lens cameras,? said Panasonic UK’s Lumix G product manager Barnaby Sykes. But Sykes admitted that, in the past, many consumers may not have realised compact system cameras (CSCs) were meant for them: ?As brands we have not educated the consumer enough about who they [CSCs] are aimed at,? he said. Panasonic plans to raise awareness of the benefits of its DMC-GF3, for example, by briefing shop staff and hiring professional demonstrators. The move comes as the firm is set to launch a TV advertising campaign for its G3 model. Asked if Panasonic fears a loss of market share, in light of Nikon?s recent entry into the market, and speculation Canon may soon follow, Sykes replied: ?It will help to grow the [CSC] format. It can only help us with the line-up we already have.? Meanwhile, the GX1 is billed as a sophisticated ?premium?-level interchangeable lens compact sporting a leather handgrip. In an interview with Amateur Photographer (AP), Panasonic?s product planning group manager Michiharu Uematsu was keen to stress that the GX1 is a ?new line? – not a revamped GF3 but aimed at the photo enthusiast seeking more manual control. Housed in an aluminium body similar to the GF1, and carrying a 16-million-pixel imaging sensor borrowed from the G3, the GX1 will cost £499.99 (body only) when it goes on sale in mid-December. It boasts a 0.09 sec AF speed (compared to 0.1 sec on the G3), and maximum equivalent ISO sensitivity of 12,800. For the first time Panasonic has included a level gauge, which is also designed to work in portrait mode. The 318g model (body only including SD card and battery) also features ?PC-friendly? MP4-format (1920×1080) video – as well as AVCHD – and a new focusing system called AFF [Auto Focus Flexible], designed to automatically focus on a moving subject, akin to an AF tracking feature. Four Fn buttons allow the photographer to choose from 25 functions and there is a new mode dial. Also on board is Pinpoint AF, as featured on the G3, and the ability to shoot a burst of 20 frames per second at 4MP resolution, and 16MP images at 4.2 fps, according to Panasonic. New digital effect options include ?low key? and ?toy effect?. Panasonic claims that the ?lens speed? (measuring the read-out from the sensor) is 120 fps – double that of previous cameras. An optional, 1.44m dot-resolution 90 degree, tilting viewfinder (LVF2) will be available from mid-December, priced £229. 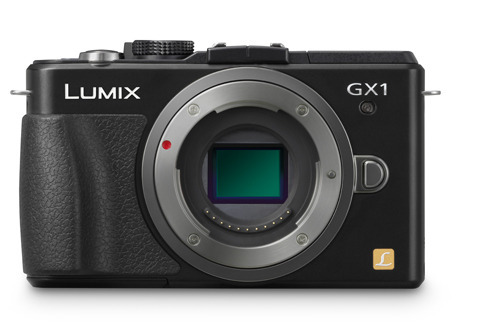 The GX1 will be out as a kit with a standard 14-42mm zoom (priced £599.99) and with a 14-42mm G X Vario PZ (powerzoom) – the latter not due to go on sale until January, priced £729. Panasonic plans to launch two more lenses next year and will phase out the G2 model.